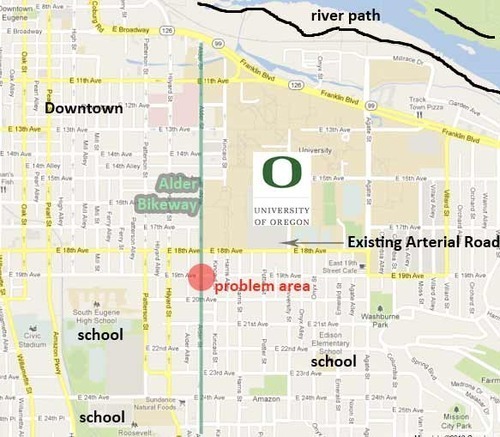 Alder Street in Eugene is a bicycle backbone connecting a good portion of south Eugene, the University of Oregon, the extensive river path system, and downtown commercial areas. The corridor is very busy with bicycles at all times of days and night. It truly is a signature corridor that should inspire more like it around the community. It is about to be repaved from 19th -24th. But, it is still incomplete (!) and I have three suggestions to complete the Alder Signature Bikeway, including two moderate decisions, one easy decision, and one category of tweaks. This post will focus on a moderate re-design of the intersection of Alder and 19th to make it more consistent with the Alder Signature Bikeway. Quick peak: this proposal reverses the stop signs to allow throughput of bicycles on Alder and eliminates the southbound automobile left turn from Alder onto 19th.